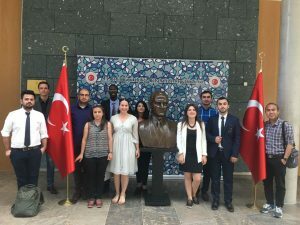 On June 24, 2017, the annual study and research trip of INSITER with the group of MA students of “European and International Affairs” of the Turkish-German University Istanbul was concluded. This year the students visited Paris (June 4-10), Brussels (June 11-16), Cologne (June 17-18) and Berlin (June 19-24). 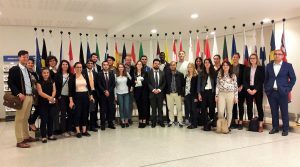 The journey served the purpose to experience real life politics first-hand and to take teaching inside the Turkey-EU relations by enabling the students to step into the everyday work of European, Turkish and International Organizations. By getting into direct contact with decisions makers of leading political, economic and administrative institutions students were able to study the complex interaction between the EU, national and subnational level of decision-making in the ‘multi-level’ political system of the European Union and to get a hands-on perspecti ve on how Turkey-EU relations are shaped in practice. 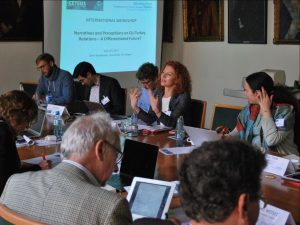 The programme was partly carried out in cooperation with other international partner institutions such as the University of Cologne, Sciences Po Paris, Université de Sorbonne Paris, Charles University Prague and the Centre International de Formation Européenne. Besides the joint visits to institutions the internationally composed group of students could engage in a simulation exercise that dealt with EU-Turkey relations in the context of differentiated integration in Europe. The full programme of the excursion can be found here. 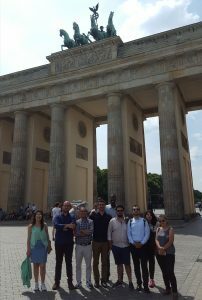 In the final week of the INSITER research and study trip the group of MEIA students of the Turkish German University visited a number of political institutions in Berlin, Germany. 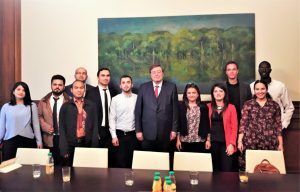 Together with students from the University of Cologne and the Centre International de Formation Européenne meetings were held inter alia with representatives of the German Chancellery, the German Bundestag, the German Federal Foreign Office and the German Ministry of Finance. In addition to the visit to official state institutions the stay in the German capital also served the purpose to exchange views with researchers and practitioners from Berlin-based think tanks and interest representations, notably the Institute for European Politics (IEP), Polis 180 and the German Trade Union Confederation. Finally, in order to grasp the history of Germany and Berlin, the group also went on a city tour that focused on the political architecture of the city. Students and organisers are extremely grateful for the precious time and the valuable input from the different hosts and institutions. The final week of the INSITER study visit took place in the German capital, Berlin. One of the highlights of the 1 week visit to Berlin has been the meeting with Ufuk Gezer, chargé d’affaires a t the Turkish Embassy in Berlin. During a lively conversation, Mr. Gezer put particular emphasis on German-Turkish relations differentiating between economic, political and social aspects of this complex dialogue. Mr. Gezer furthermore provided insight on Germany’s role in the formation of the relationship between Turkey and the E U and talked about the latest developments with regard to the Turkish diaspora in Germany in economic, political and social terms. AVU 114, Abdoul Yoro Diallo, “European External Action Service”, read here. AVU 101, Canan Uzuntaş, “The Impact of Brexit (together with other factors) on the EU-Turkey Relationship”, read here. AVU 107, Canan Uzuntaş, “Alternative EU Membership Models and Their Suitability for the UK and Turkey”, read here. AVU 106, Batuhan Çelebi, “Review of the Book: Economic Sanctions and Presidential Decisions- Models of Political Rationality – Author: A. Coper Drury”, read here. 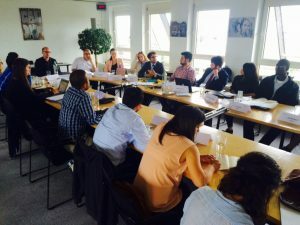 On June 15 and 16, 2017, as an integral part of the study trip week in Brussels, the INSITER students participated in an international simulation exercise with students from Cologne, Paris and Prague. The overarching idea of the exercise was to discuss different forms of partnership between the EU and third states in the form of a two day Moot Court of the European Court of Justice that focused on Alternative Partnership Agreements. Students had started to prepare for the simulation exercise in April already in interdisciplinary and international teams in order to defend their position at the Moot Court. The best teams received an award for their performance. The final judgement of the simulation exercise’s judges can be found here. 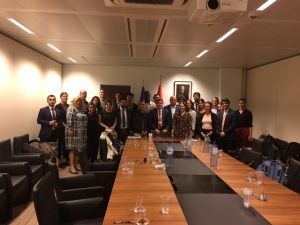 The annual INSITER study trip of the Turkish-German University’s MA programme “European and International Affairs” (MEIA) continued with various interesting meetings in Brussels between June,11-16, 2017 , inter-alia with visits to the Permanent Delegation of Turkey to the EU, the European Parliament, Scottish Government EU Office, the Legal Services of the European Commission, the Directorate General for Neighbourhood Policy and Enlargement Negotiations and Andrew Duff, Former Member of the European Parliament. 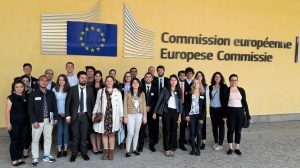 The Brussels visit was realized in close cooperation with the University of Cologne and Sciences Po and included students from University of Cologne, Sciences Po, Sorbonne University and Charles University Prague. One of the highlights of the Brussels study visit has been the lively conversation with Ambassador Faruk Kaymakçı, Permanent Delegate of Turkey to the EU. During the talks, Ambassador Kaymakçı provided an overview of the history of relations between Turkey and the EU, identified the recent challenges with regard to Turkey’s EU accession process (including the Cyprus conflict) and emphasized the importance of reform of EU-Turkey Customs Union. The visit was also made public on the official Twitter page of Ambassador Kaymakçı. Another highlight has been the guided tour of the European Parliament. The students had the opportunity to get information on the institutional structure of the European Parliament, political groups in the European Parliament and latest trends in the European political landscape, as well as were able to have a look at the plenary chamber. On June 8, 2017, INSITER Co-Coordinator Ebru Turhan participated in the TRIANGLE Workshop of CETEUS at the University of Cologne titled “Narratives and Perceptions on EU-Turkey Relations – A Differentiated Future?”. Turhan held a talk on “Opportunities and Challenges for Extended External and Internal Differentiated Integration between Turkey and the EU.” The workshop included other speakers such as Wolf-Ruthart Born, former Secretary of State, Bianca Benvenuti, IAI, Aras Lindh, Swedish Institute of International Affairs, Funda Tekin, CETEUS and Dicle Korkmaz, METU. 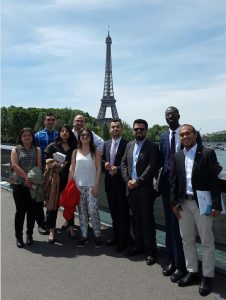 The annual study trip of the Turkish-German University’s MA programme “European and International Affairs” (MEIA) continued with various interesting meetings in Paris, inter-alia with visits to the Turkish Embassy and the Turkish Delegation to the OECD. The study trip is realized within the framework of the INSITER, under the supervision of INSITER Co-coordinators, Asst. Prof. Dr. Ebru Turhan & Asst. Prof. Dr. Wulf Reiners. The students and the INSITER team are thankful for the warm welcome and the enlighthening exchanges. 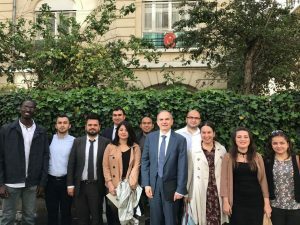 On June 7, the MEIA delegation met with Erdem Tunçer, Premier Conseiller, Aslin Savran, Political Conseiller, and Özlem Nurdalı, Commercial Conseiller at the Turkish Embassy in Paris. The exchange focused on the latest developments concerning the political, economic and social relations between France and Turkey, the French position on Turkey’s EU accession process and the French domestic political landscape. The visit has also been documented on the Embassy’s social media presence (see here). Representative of Turkey to the OECD and the former Governor of the Turkish Central Bank on June 9. The talks with the Ambassador centered around the evolution of Turkey’s status within the OECD, Turkey’s impact on the institutional architecture, agenda-shaping and policy-making within the OECD. Beyond that the students could also discuss recent challenges and opportunities in the global economic governance and the future of EU-Turkey relations. 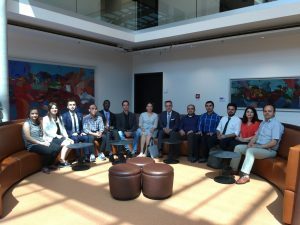 On June 4, the annual study trip of the Turkish-German University’s MA programme “European and International Affairs” has officially started. The programme takes place in the framework of the INSITER project and is financially supported by the German Academic Exchange Service (DAAD) and the German Federal Ministry of Education and Research. In the next three weeks, it will take the students to Paris, Brussels, Cologne and Berlin to gather first-hand insights in European decision-making and EU-Turkey affairs. A draft of the full programme can be found here. On June 6, the programme kicked-off with a meeting with Prof. Dr. Pascal Hector, deputy head of mission of the German embassy in Paris. 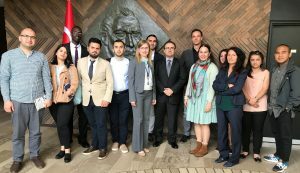 The exchange was particularly interesting as Prof. Hector had also been involved in the setup of the Turkish-German University in his function as deputy head of mission of the German embassy in Ankara between 2009 and 2012. The students and the INSITER team are thankful for the warm welcome and the good discussions at the Embassy. From May 29 to 31, 2017, INSITER Co-Coordinator Ebru Turhan participated in the 31st IISES International Academic Conference in London. Turhan presented a conference paper titled “Domestication of Germany’s European Policy and German Leadership in the EU: The Cases of Eurozone Crisis and Refugee Crisis.” Research for the conference contribution was conducted in the framework of the INSITER project. The paper that was published within the framework of the conference proceedings can be found here.